Deep ecology, a term coined by noted Norwegian philosopher Arne Naess, is a worldwide grassroots environmental movement that seeks to redress the shallow and piecemeal approache of technology-based ecology. Its followers share a profund respect for the earth's interrelated natural systems and a sense of urgency about the need to make profound cultural and social changes in order to respore and sustain the long-term health of the planet. This comprehensive introduction to the Deep Ecology movement brings tgether Naess' groundbreaking work with essays by environmental thinkers and activists responding to and expanding on its philosophical and practical aspects. Contributors include George Sessions, Gary Snyder, Alan Drengson, Dll Devall, Freya Matthews, Warwick Fox, David Rothenberg, Michael E. Zimmerman, Patsy Hallen, Dolores LaChapelle, Pat Fleming, Joanna Macy, John Rodman, and Andrew Mclaughlin. The Authrs offer diverse viewpoints- from ecofeminist, scientific, and purely philosophical approaches to Christian, Buddhist, and Gandhian-based principles. Their essays show how social, technological, psychological, philosophical, and institutional issues are aall fundamentally related to our attitudes and values toward the natural world. 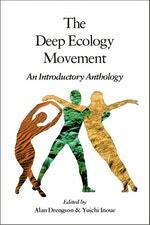 Love Deep Ecology Movement? Subscribe to Read More to find out about similar books.